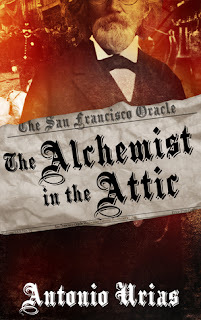 Set in 1899, newspaper hack Theodore Atwood desperately needs a big scoop to prevent the San Francisco Oracle from going under. Following various leads, he learns that a man called Dr Marius Valencourt may be responsible for several bodies washing up on the shore of the Bay. Atwood seeks to uncover more about the mysterious doctor and the secret he's guarding in his room in the attic. The Alchemist in the Attic was a good read, although I did find the pace a little bogged down. The characters were well fleshed out and the author set the scene of the turn of the century nicely with the inclusion of bodysnatchers, séances, opium dens and asylums. The twist or 'big reveal' at the end was especially good and I doubt anyone reading could predict that. I'm sure I'll be sleeping with the lights on tonight! My thanks to author Antonio Urias for providing a copy of this book. As the city prepares to welcome the new century, a twisted killer enacts his final, grisly legacy. Theodore Atwood is a disgraced reporter desperate to find a story that can save his career. No one knows San Francisco’s seedy underbelly better, but the deeper he digs the more grotesque and bizarre the case becomes. Haunted by dreams and phantoms, Atwood follows the killer’s trail from the den of thieves and bodysnatchers to a secret society of spiritualists and occultists. Meanwhile, hidden in the shadows the alchemist readies for his enemies. Disgraced and dying, he will sacrifice countless lives to complete his terrible work. As the city descends into a fevered nightmare around him, Atwood is caught in a deadly game of cat and mouse. He will have to fight to the brink of madness and beyond in order to survive--for he has entered a world of dark science and alchemy and there is no turning back. The Alchemist in the Attic is an occult mystery.